Although it does not exist today, the Jewish Temple is undoubtedly an important part of end times Bible prophecy, and we can easily point to relatively recent events to see how it is shaping up to become a major event. Several significant places in prophetic scripture refer to the temple. At this point in time, it would be nothing short of a miracle for the rebuilding of the temple to happen, given all the unrest and conflict concerning the Temple Mount right now between the Israelis and Palestinians. Yet, statistically, we have a much greater chance now than has ever been possible because in 1967 Israel took control of Jerusalem in the Six-Day War. 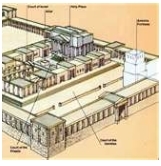 The Temple Institute is dedicated to all aspects of the Divine commandment for Israel to build a house for G-d’s presence, the Holy Temple, on Mount Moriah in Jerusalem. The range of the Institute's involvement with this concept includes education, research, activism, and actual preparation. Our goal is firstly, to restore Temple consciousness and reactivate these “forgotten” commandments. We hope that by doing our part, we can participate in the process that will lead to the Holy Temple becoming a reality once more. It is quite clear that the Bible explains the Rapture can occur at any moment. Therefore, as we go about our daily lives as described in Luke 17:26-36 (eating and drinking, marrying, working, building, etc. ), we should follow the words of Jesus in Luke 21:36, "Be always on the watch, and pray that you may be able to escape all that is about to happen, and that you may be able to stand before the Son of Man." For more information about that topic and many others, a good resource to help understand Bible prophecy is a book called, Pray That You May Escape.